Swedish investigators have just published a study in the Journal of Clinical Periodontology documenting “no significant association between gingivitis, [periodontal pockets] and periodontal disease experience and snus use.” (abstract here). The authors are Anders Hugoson from Jönköping University and Margot Rolandsson from Karlstad University. The study was based on 1,500 residents of Jönköping who took part in detailed dental health exams in 1983, 1993 and 2003. Hugoson and Rolandsson supervised teams of dentists who collected information on the number of teeth, plaque index, presence of inflammation of the gingiva (gum tissue), periodontal pocket depth, gum recession, calculus, and x-ray examination. The findings were used to classify participants according to the presence and severity of gum, or periodontal, disease. The results were adjusted for factors that might influence the development of periodontal disease, such as age, gender, and socioeconomic class (education, employment and marital status). Severe periodontal disease among snus users was about as common as among nonusers of tobacco (OR = 0.8, not statistically significant). This is in essential agreement with a comprehensive review published by Kallischnigg and colleagues in BMC Oral Health in 2008 (available here). Furthermore, it suggests that the federally mandated smokeless tobacco warning, “This product can cause gum disease and tooth loss,” is not relevant to snus, if it is scientifically credible at all. The prevalence of snus use among men doubled from 9% in 1983 to 17% in 2003, while the prevalence of smoking was cut in half, from 29% to 14%. This study provides more evidence that use of snus by Swedish men has resulted in real benefits to their general and oral health. 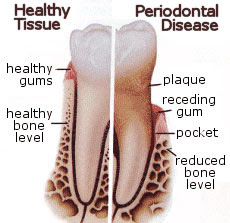 It is really an eye opener as we usually co-relate gum diseases with the use of tobacco more often. I just hope that the findings are true and can help give away our earlier misconception.